I picked up the homeliest little table on the curb one day. I contemplated leaving it right there in the rain but finally decided to bring it home. All it needed was a little bit of love. Love in this case meant gluing, clamping, removing random staples on the top’s underside and sanding. My intention was to paint the whole thing after sanding but once I got the top layers off, this table showed me her true beauty. I ditched my original plan and stained the top in walnut. Look at how that grain pops! 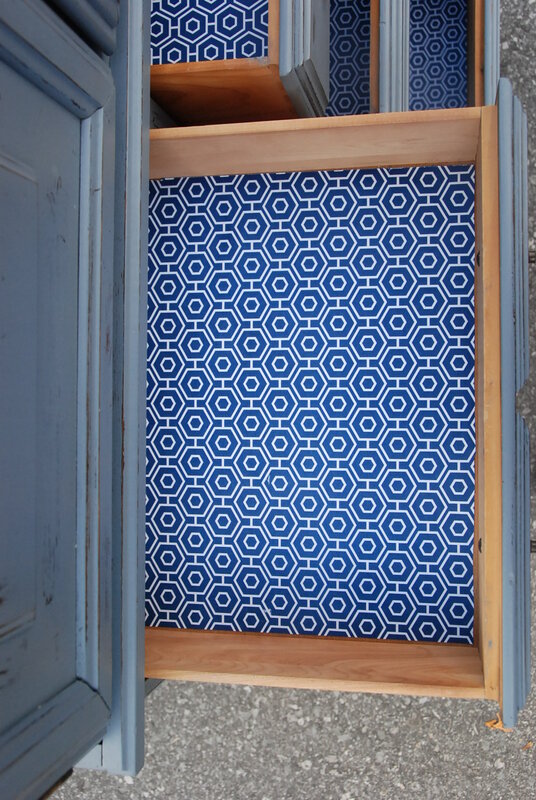 I wanted this table to be a really cool, funky and original accent table so I chose nocturne, a lovely shade of blue. And it goes brilliantly with the walnut top. Together they bring out the decorative brass detailing that blended in too well before this transformation. I finished it off with a dark finishing wax to bring out the grain even more. As is the case in so many pieces I’ve worked on, I wish I had the room for it in my house. She’s a real beauty. The Green Bin’s Market Debut! I’m incredibly pleased to announce that The Green Bin is making its debut as a vendor at the Metcalfe Spring Market! Come and join us on April 16th from 9am-2 pm just 20 minutes south of Ottawa at the Greely Legion, 8021 Mitch Owens Road. I’ve been working on some really cool items for the home, including vintage jewelry boxes, rustic growth charts and a collection of white shabby chic pieces that I’ve fallen in love with. Come on out and support local producers, artists and growers! Although it seems like all’s been quiet on The Green Bin front for the last few weeks, there’s actually been so much happening behind the scenes! Now that I’ve got a couple large commissioned projects finished and happily tucked away in their new homes, I’m ready to officially unveil a new The Green Bin website and logo! 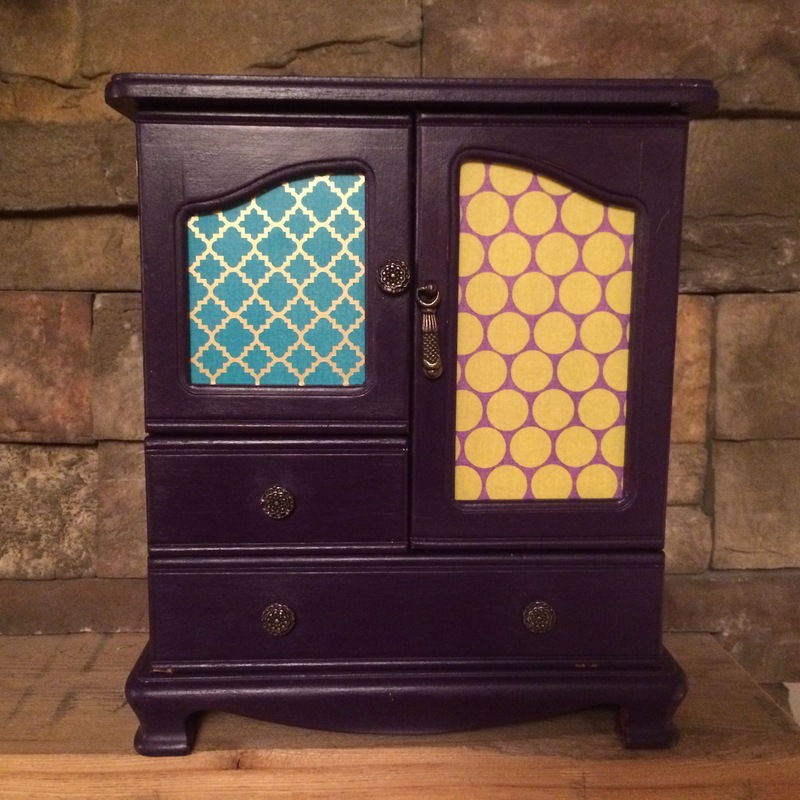 They reflect the direction that The Green Bin has been taking for the past few months: a furniture and home goods upcycling business that blogs about eco related topics. Well, The Green Bin began as an eco blog. 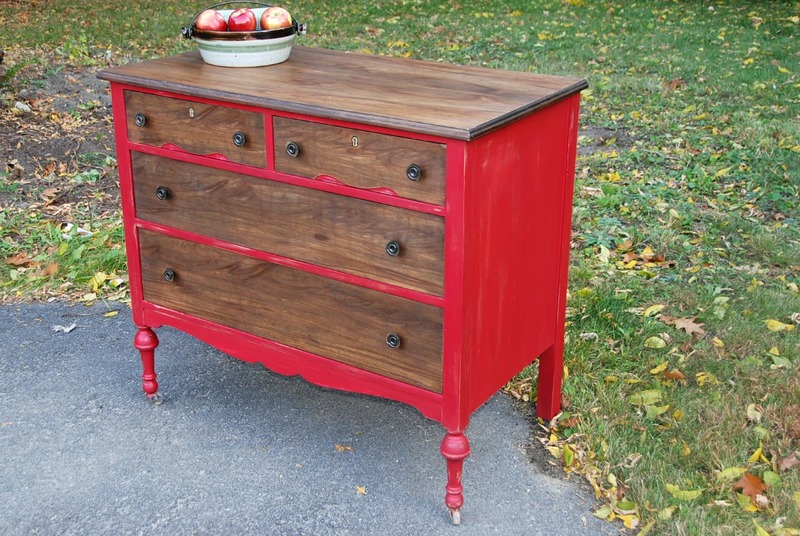 At around the same time, I rediscovered my love for refinishing and upcycling furniture. Before long, I was selling pieces and having fun doing it. It just made sense to combine the two elements under The Green Bin. Upcycling falls into the green movement as it offers a more conscientious alternative to buying new goods. Refusing to buy new products reduces our carbon footprint and upcycling keeps items with life left in them out of landfills. It also helps reuse items no longer wanted or loved, repairs anything that needs attention and extends the life and beauty of furniture and home goods. Plus, there are so many gorgeous, vintage, unique and custom pieces out there to find! Welcome to the new and improved The Green Bin. Two local ladies are helping Ottawa’s pets in need by recycling and upcycling just about anything they can get their paws on. Barbara Poulin and Melody Lachance run Empties for Paws – Barrhaven & Area, a not-for-profit group. They turn appliances, textiles, empties (including wine box bladders!) into cash and supplies to help rescued cats and dogs. The duo pick up, collect and sort broken Christmas lights, power cords, coffee makers, telephones and e-waste. They bring what they’ve collected to the scrap yard, where they are paid by the pound. Local groups that benefit from the Barrhaven chapter of Empties for Paws include Adopt Me Cat Rescue, Safe Pet Ottawa, Pet Resource Bank and Vanier Street Cat Project. The money helps the groups to get animals spayed or neutered, provide young kittens without their mothers with specialty food, assist seniors and low income pet owners with transportation to get to the vet and foster animals that need a home while their family members leave abusive situations. The ladies have raised nearly 2,000$ since March 2015. But it’s not all about the money. Donations are another major factor in their achievements. They pick up, collect and distribute donated carrying cases, cages, crates, beds, food, cat litter, litter boxes and toys. These ladies are also crafty and creative. They upcycle gifted textiles, fabrics, towels and bedding; transforming them into animal beds, pads, toys and tuggs. I love this program. Helping local pets in need through a recycling and upcycling program has my two thumbs up. So don’t throw out those random cords or telephones that don’t work! Don’t stick your beer cans in the recycling! They have another purpose to serve: helping animals in need. If you have anything that could help Barb and Melody on their mission with Ottawa rescued cats and dogs, please send me a message or be in touch with them directly. They can be reached via the Empties for Paws – Barrhaven and area Facebook page. If you’re reading this and are no where near Ottawa but would like to help, place a call to your local animal shelters or pet rescue organizations. Moss green is my latest colour obsession. I’m not sure if I’m already anticipating spring, which is not a good sign because it’s mid-January in Canada, or simply just in love with this colour. Either way, I just want to paint everything in various shades of this lovely green. 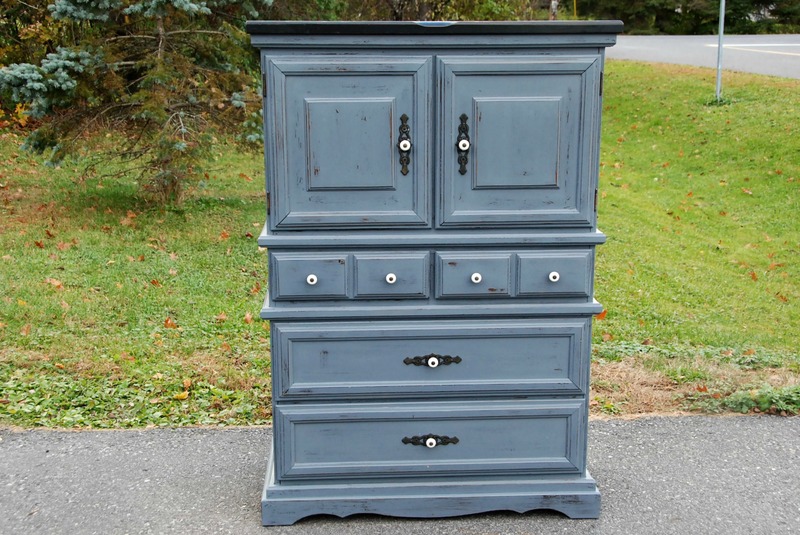 I was attracted to this vintage dresser because of its waterfall front, detailed wood carving and lovely handles. I knew it would be amazing in moss. I wasn’t wrong. To keep interest in the piece and add depth to the colour, I distressed it with sand paper then I very, very, very lightly painted what I purposely over-sanded. But I did run into a problem: I have no room for it in my house! 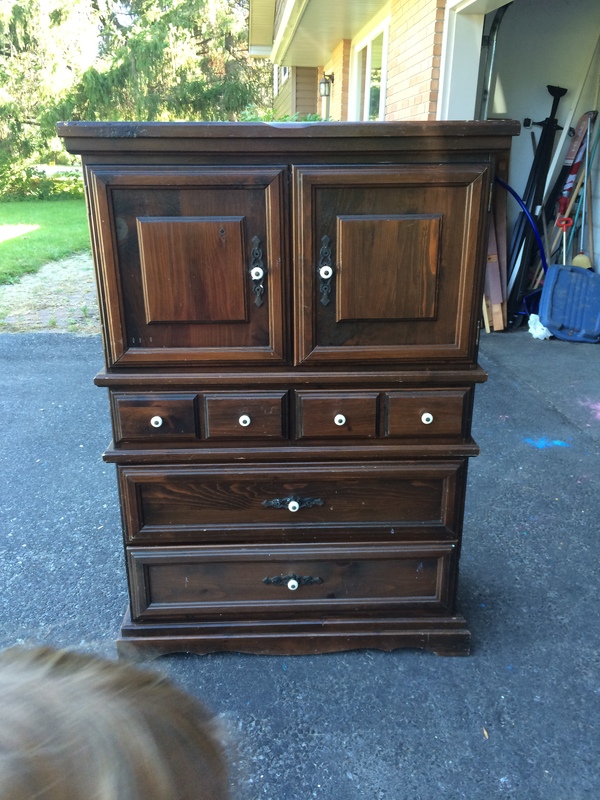 I was so pleased when I came across this dresser. It was in perfect condition. There were no funky smells to get rid of, no wonky drawers to realign, no knobs to replace and no parts to repair. With its dovetail joints, beautiful lines and amazing vintage handle pulls, it certainly was a dream piece to bring back to life. Did it need to be redone? The pattern in the wood killed me. Maybe I have a vivid imagination, maybe not. 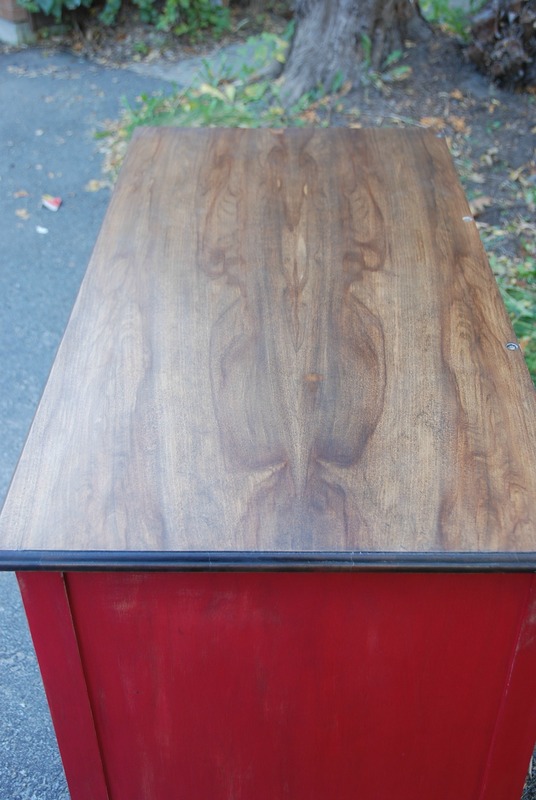 But I certainly don’t think I’m alone in thinking that this dresser has the oddest wood pattern I can ever recall seeing on the front of a dresser. So I painted right over top of it in a lovely antique white. The first coat almost always ends with me seriously regretting my paint colour choice. There’s something ugly in a first coat of paint. With this project, I even seriously regretted it after the second coat. 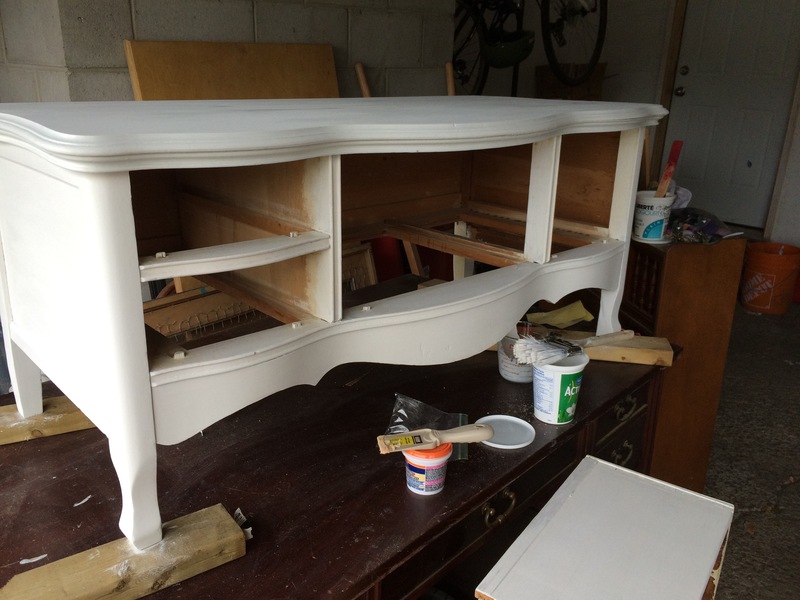 But by the time the third coat went on, I was so pleased with my decision to go with antique white that taking the paint off to distress it in a vintage shabby chic style was a tad painful. But I did it anyways and I love the way it turned out. And so does the lovely lady who gave it a new home in a place I had never thought to put a dresser: an office! She said that she was surrounded by ugly office furniture and “needed something beautiful to look at all day”. 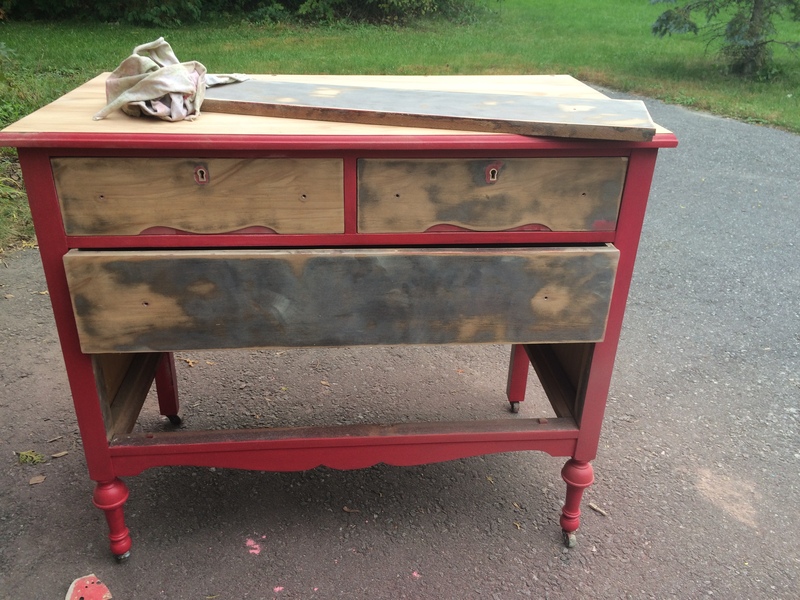 So this vintage dresser is now fulfilling the role of a filing cabinet and probably gets more attention that it ever would in a bedroom. 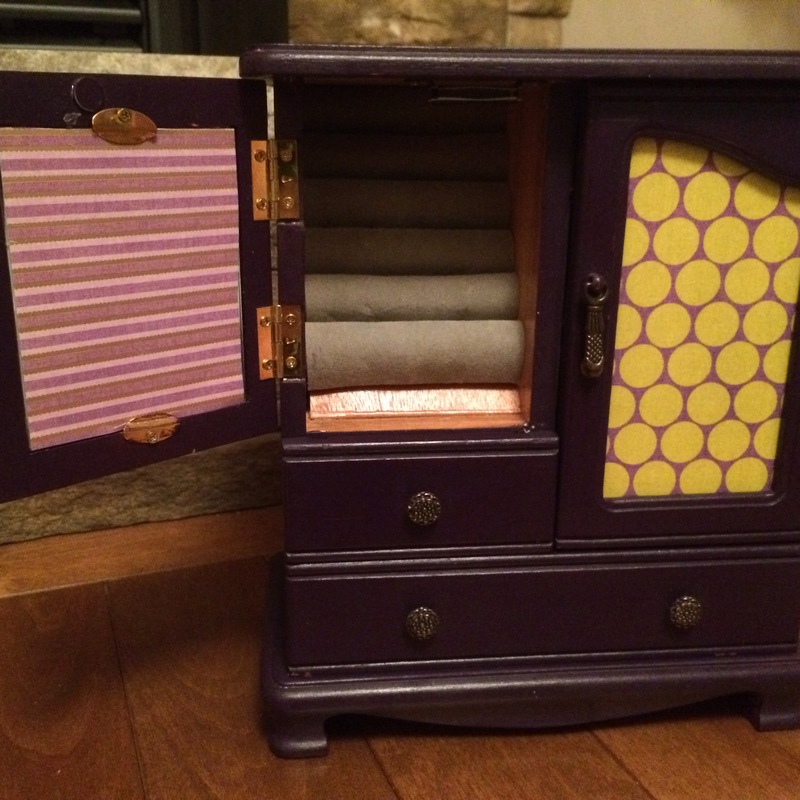 I found this very dated jewelry box at a second hand store in the summer and bought it with the intention of giving it a makeover and gifting it to my three year old for Christmas. Naturally, I didn’t hide if very well and she found it (more than once). Every time she played with it, she told me how much she liked it. It was destined to be a hit. I thought about reconstructing it to really make it unique but reason won. She’s three and a half and her little sister’s current nickname is “The Destroyer”. 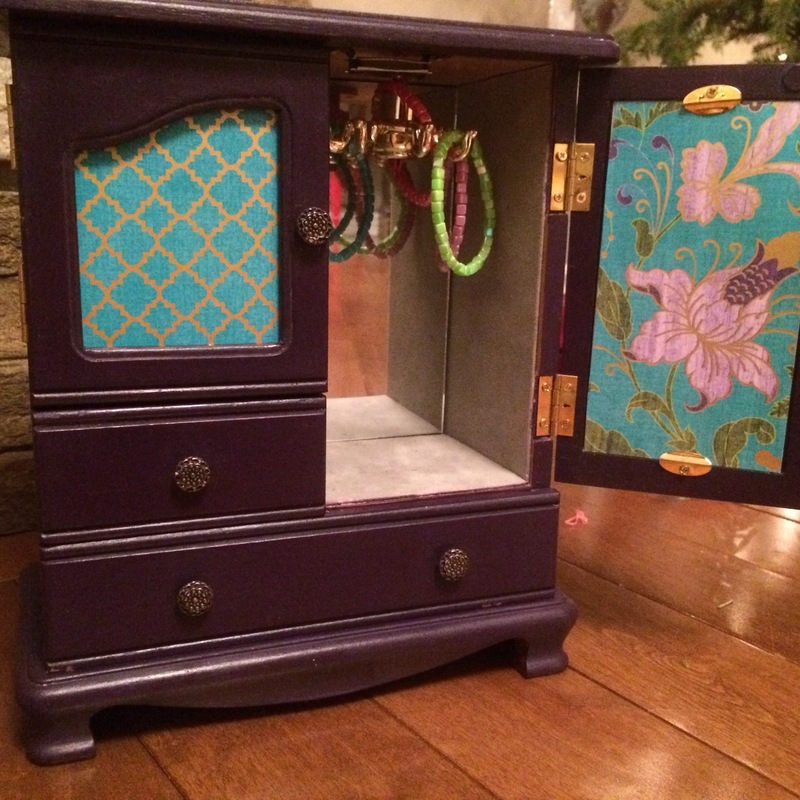 I’ll be happy if the jewelry box makes it through to the end of January. They will eventually each get an heirloom box but that can wait until they can appreciate, and not tear apart, pretty things. For those reasons, I kept this makeover simple. Luckily the itty bitty handle pulls are quite lovely and complement the colour I chose, “sovereign”, quite well. I used four different but equally pretty pretty crafting paper I had kicking around. I applied Modge Podge to both glue and seal the paper to the glass. On Christmas morning, it was a hit. She loved the box and the bracelets I hid inside. We bonded on a busy Christmas morning when I explained that was a special gift just for me to her. She understood. Every time someone comes over, she brings them to show them her “special” jewelry box. This was such a fun project to work on that I can’t wait to work on more custom jewelry boxes. 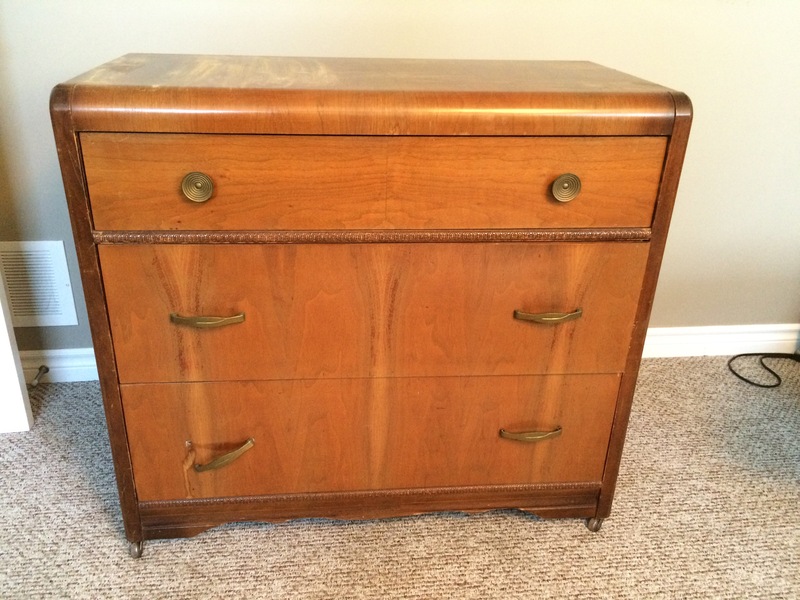 I picked up this chest of drawers at a mid-summer garage sale. Finally in the fall, I painted it antique white. And it sat for another few weeks. All the while, I attempted to remove the green dragon – a thick green velvety material stuck to the inside of the drawer with an industrial strength adhesive. I had to get it off. I used scrappers, scissors, adhesive removers, pliers, box cutters and straight razors. They all helped chip away at the green dragon but nothing was very effective. I took out my orbital sander and sanded some of it off. Green bits went flying everywhere. It was joyous. Yet, the green dragon still remained. 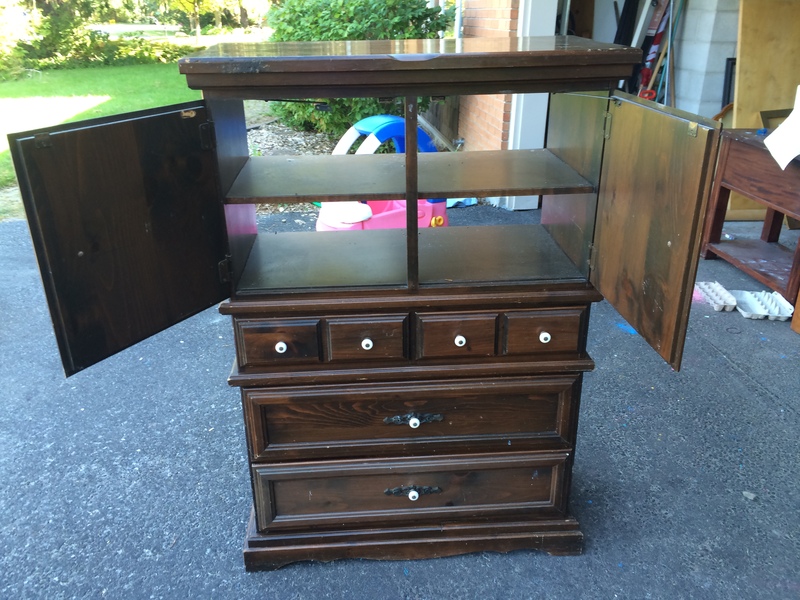 It was a shell of its former self, but it was still torturing that drawer. And I just couldn’t get it off. This dragon had to be slayed and the white paint needed a lift. Where was inspiration when I needed her? Well, wouldn’t you know, she was hiding in my fabric stash. 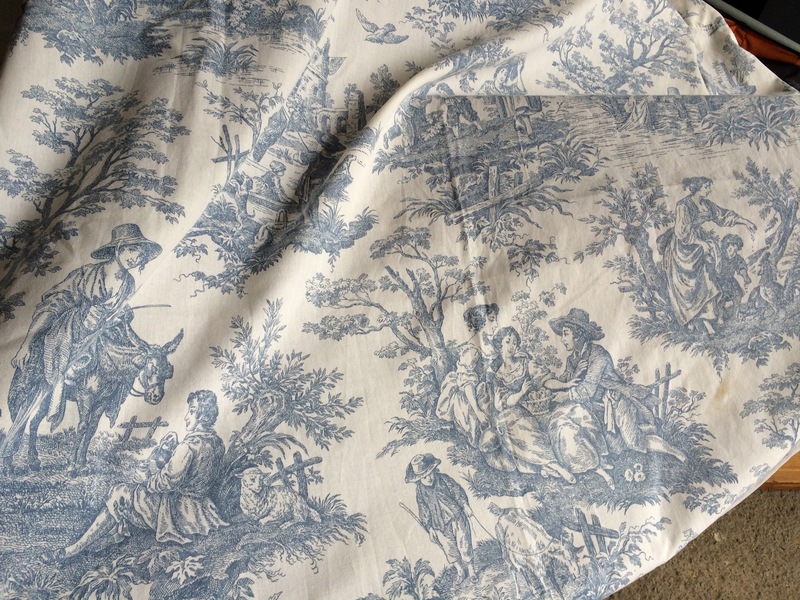 Luckily I’m a bit of a fabric hoarder and I happen to have two yards of a lovely blue and white toile de Jouy, the classic French textile. It inspired me to refinish this piece in two tones. 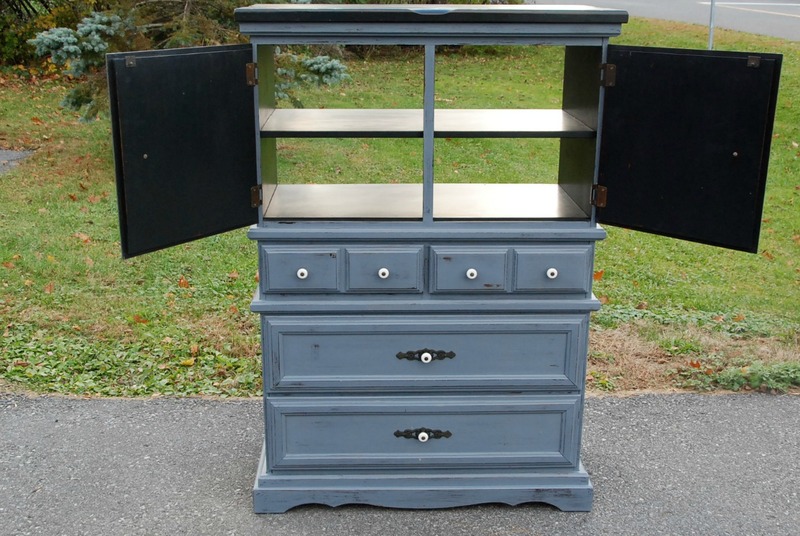 I kept the drawers antique white but repainted the rest of the body in intellectual gray. Antique and intellectual. They complement each other nicely. What I love about this piece is it’s history. It’s got bumps and bruises that make me wonder where it’s been and how it found its way to me. I did some minor repairs but left the character building flaws intact. I applied some distressing techniques to give it an aged French provincial mood. As for the dragon, well, I had no fight left so I decide to take the high road: I painted it. Bye bye green dragon, hello French beauty. Look at those curves! She’s stunning indeed. Where would you put her if she lived at your house? 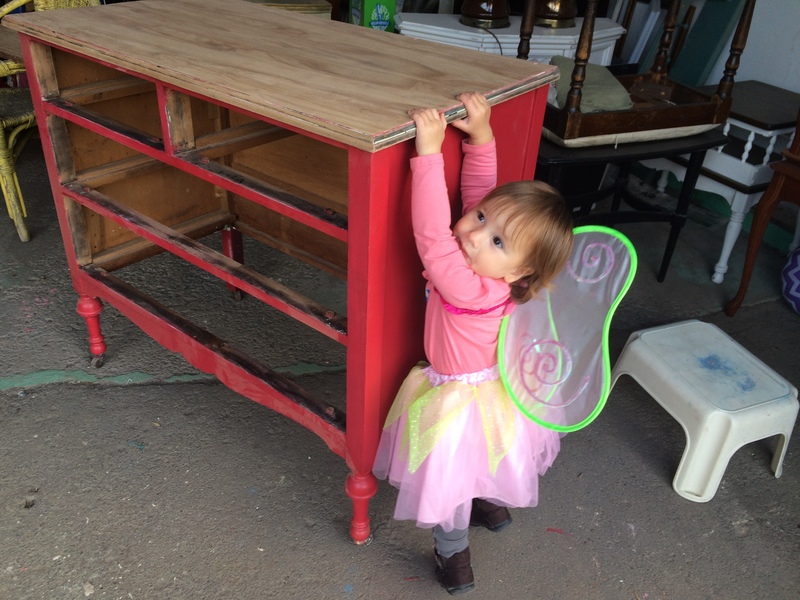 I had been hanging onto to this vintage dresser for months. It wasn’t until someone suggested that it might look good red that I finally started to visual its future look. 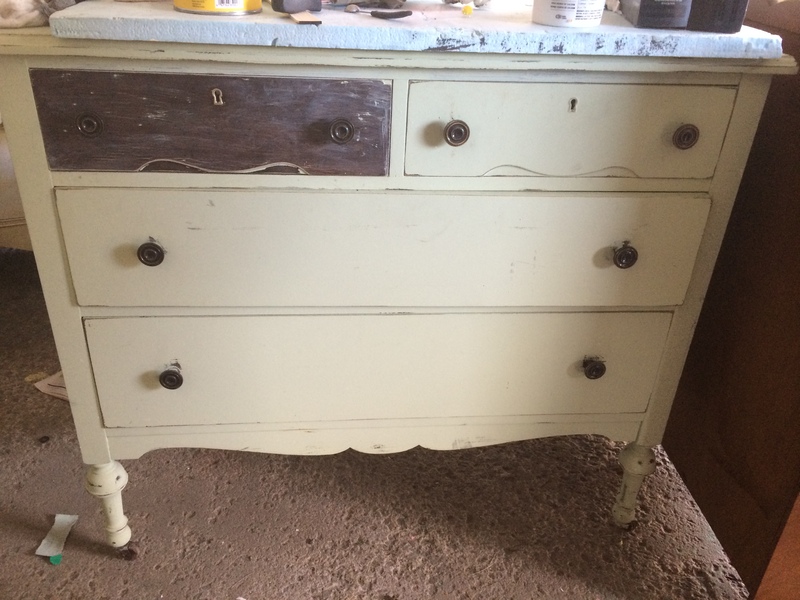 It was partially refinished in a heavy mint chalk paint when I picked it up. By heavy, I mean crusted on. By mint, I mean it just needed some chocolate chips. I love to eat mint but I can’t stand the colour. 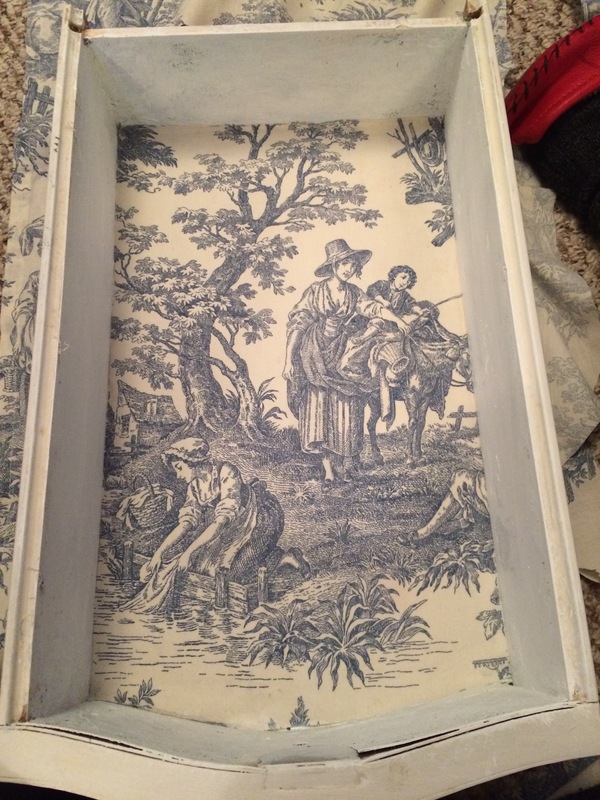 Chalk paint is water soluble so, in theory, it should come off fairly easily with a sponge, water and some elbow grease. After an hour’s work, and some very sore elbows, I got about a quarter of the paint off one small drawer. My ever clever partner was quick to note that if I was playing a video game, I would at “about four per cent done”. It wasn’t long before I took out the sander. And thus began my week long journey of spending all my free time getting the mint paint off. But what I discovered was exciting and it was worth the time investment. Under the mint paint and heavy original oil finish, lay a beautifully detailed walnut veneer. 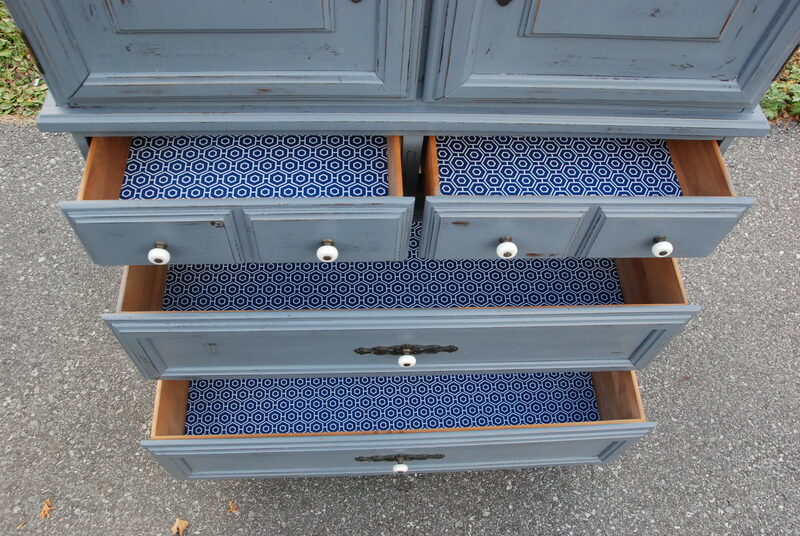 All four drawers follow the same pattern lines and are stunning. Quick change of plans and I was staining the walnut in, you guessed it, walnut stain. I mixed it with a bit of ebony of darken the look. 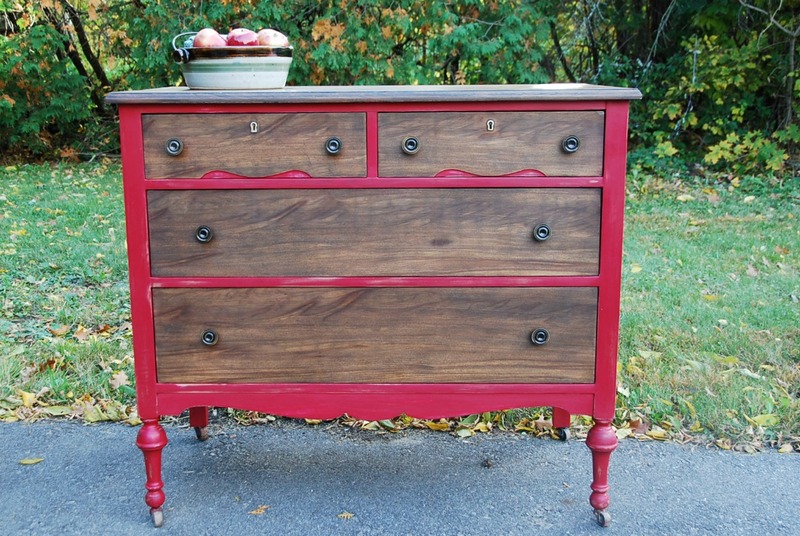 The detailing of the two top drawers is really fun. The brass keyholes and wave design add so much to this piece. The frame and the legs went ruby red since the sides were made of far less exciting material. I distressed them just enough to add a bit of old charm. The original finish was very heavy and hid the walnut. If ever I get ambitious enough to get two cats, I’m going to call them Ruby & Walnut, in honour of this dresser and the lengthy journey we went on together. As time consuming as this piece was, I’m happy with it. I feel like it was freed from its minty and oily finishes and allowed to let its true colours through. I was in a barn full of treasures when I spotted the ornate iron and ceramic handle pulls of this dresser. There was so much potential that I just had to breathe new life into this gorgeous piece. I couldn’t wait to get started. Once I got it home, I did the airing-out/removing-of-cobwebs/getting-to-know-the-piece process almost immediately. I wanted a custom shade of gray or blue so I started playing around with mixing paint. There’s something zen about taking a bit of this and a touch of that to make a colour stand on its head. And that’s what happened here. With a little black, a touch of gray and a smudge of white, I created this light shade of blue/gray that adds a whim of feminine that I wasn’t expecting. The next colour I mixed was a deep, deep navy. 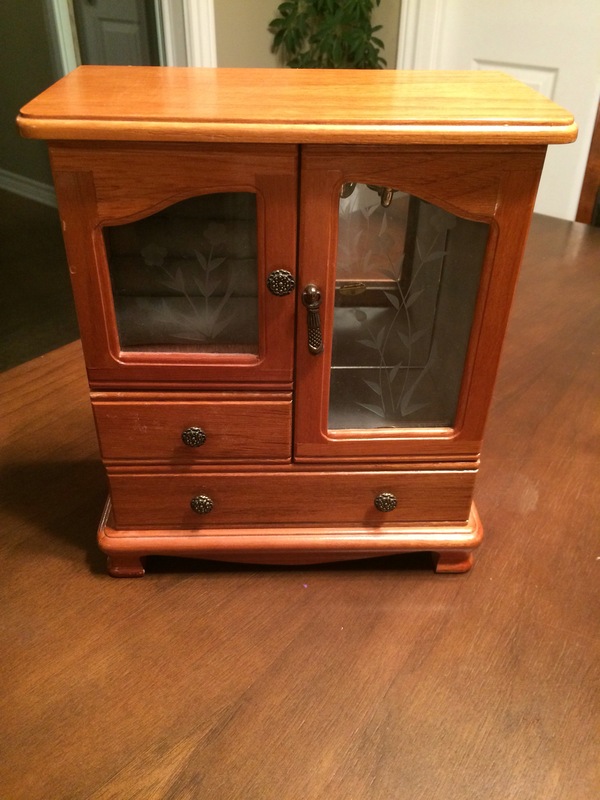 I used it for the top and interior of the cabinet. As it turns out, it is the strong yang to the soft yin of the blue/gray. The balance and contrast between these two shades of blue is striking. 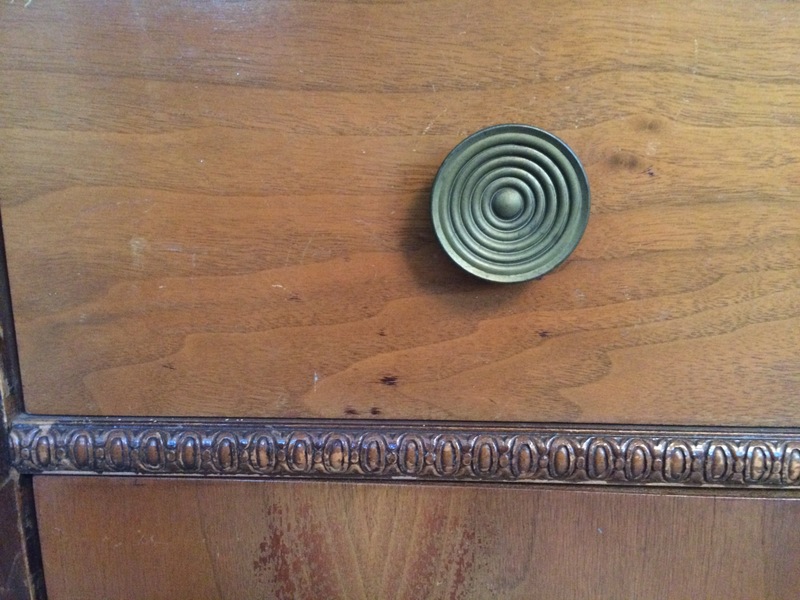 Another feature I love are the indentations on the top of the dresser. They add so much charm. It really came together after the whole piece was distressed to give it the living-in-a-barn-look. I came across a pretty navy and white quatrefoil paper at a craft store. It now lines the drawers and lends added touch of masculinity. I really love this piece. It’s feminine, masculine, bold, soft, strong and sweet. We thought it might be perfect in our home so we brought it in for a couple of weeks. Sadly, it just doesn’t work with the shades of blue and beige in our living room. I think I’ll regret the decision to sell it but I’m sure it’ll find its forever home soon and be loved again. 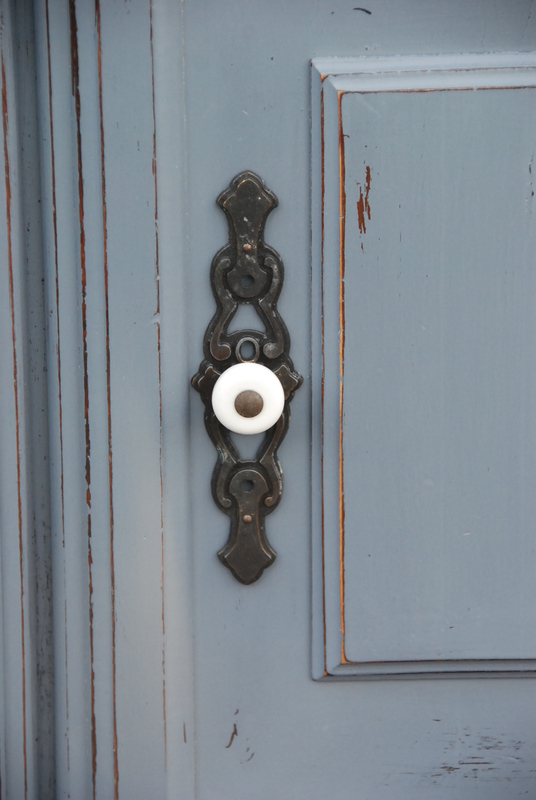 How could it not…look at these stunning handle pulls! Here are the before and after shots. Thanks for coming by and checking it out! Leave a comment to let me know what you think.